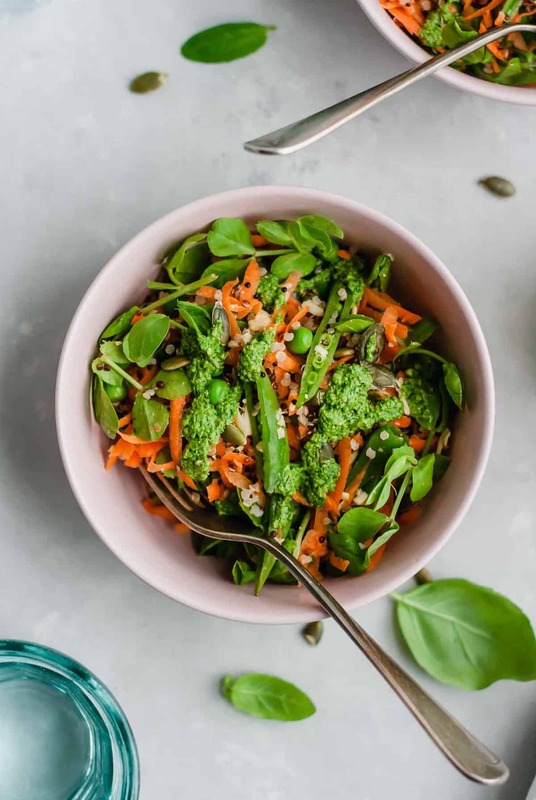 This Quinoa Salad with Pesto and Peas features sugar snap peas, grated carrots and pesto tossed with quinoa to create a light and flavourful spring salad. Apparently I have a thing for quinoa. I’m ok with that though, because I think it’s awesome. 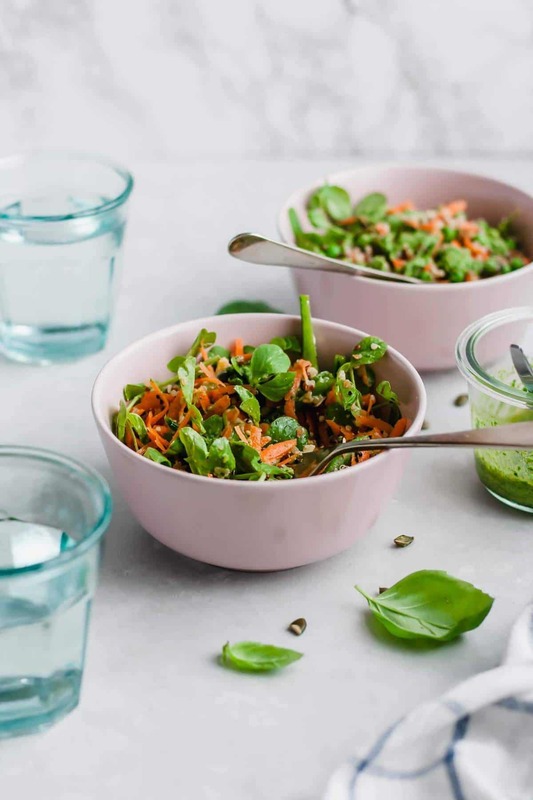 It’s super easy to cook (unless you leave your pan unattended and almost burn the house down), it sits happily in the fridge for a few days waiting to be made into impromptu breakfasts and it provides just enough carb-factor at lunchtime without completely weighing you down. 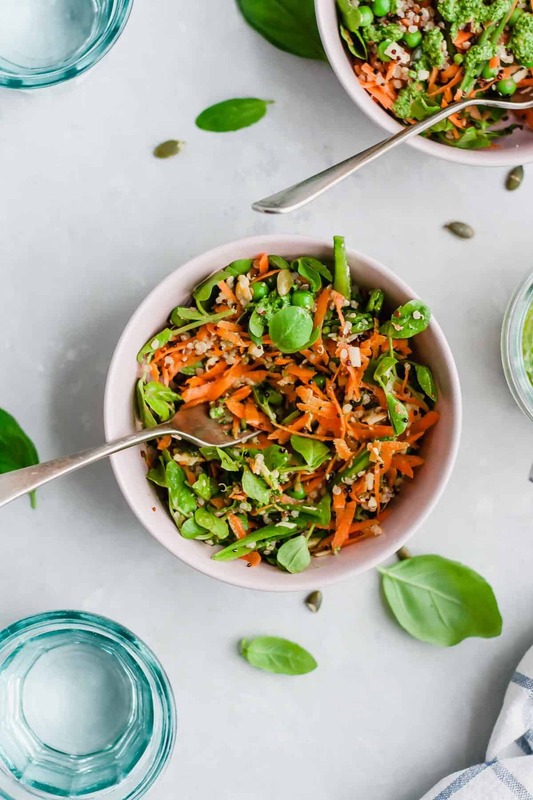 So, here’s a light and springy quinoa salad for your lunches this week, because you can never have too many quinoa salads. No, really, you can’t. And if you do happen to get tired of quinoa salads, you can always make quinoa breakfast muffins instead. Win win! Just look at all those crunchy, green things! At this time of year, I start to seriously crave green. But I must admit, I’ve been slow off the mark with that this year. I’m sure you can relate. Here in the UK, spring is about a month late, but I’m pretty confident it’s here at last! Yay! And with that, my desire to eat all the green things has returned. 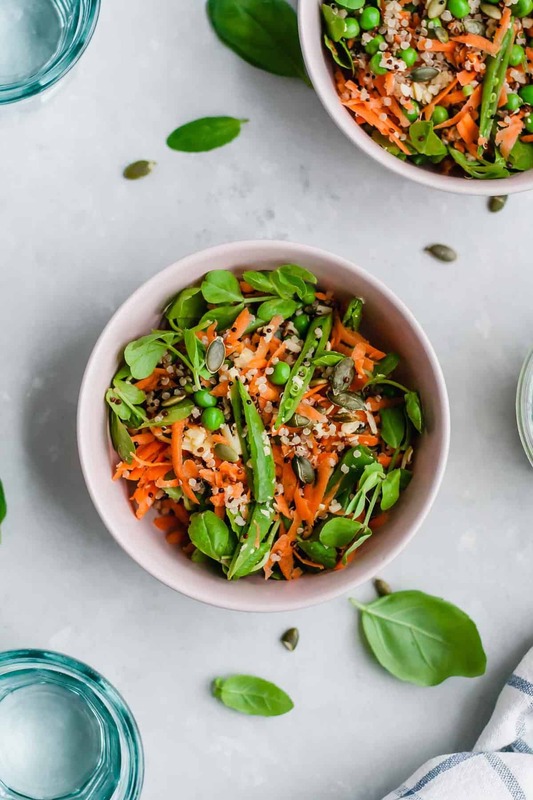 In a large mixing bowl, toss together the quinoa, peas, grated carrots, sugar snaps, grated cheese and pea shoots. In a small frying pan, toast the pumpkin seeds over medium heat until they start to pop and jump in the pan. Add these to the bowl with the rest of the salad ingredients. Mix together the pesto, oil and lemon juice and season to taste with salt and pepper as desired. If serving straight away, add the dressing to the salad and toss to coat. Alternatively, keep the salad and the dressing in separate containers in the fridge until ready to eat. Will keep for 3 days. You can use any pesto you like for this. I tend to make my own, based on what's available in my fridge at the time. 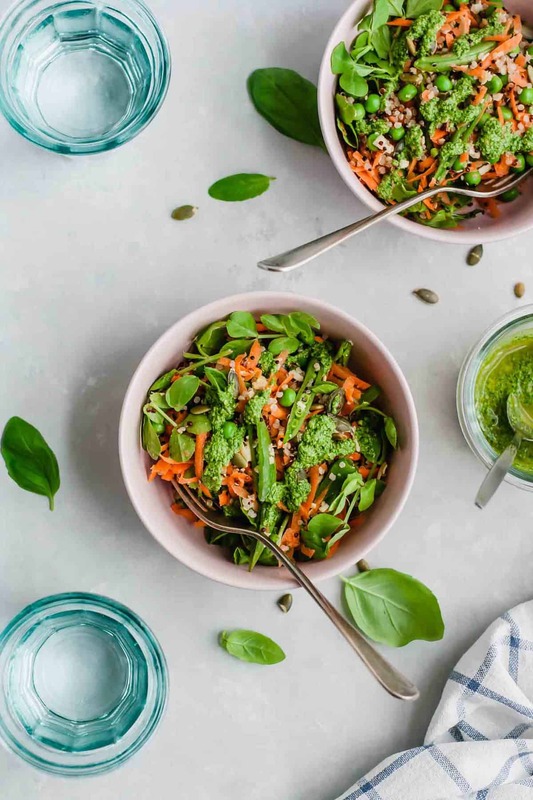 This time, I used a mix of pine nuts, almonds and walnuts (use whatever you prefer or have on hand), some extra mature cheddar, a clove of garlic, a handful each of basil, spinach and pea shoots, 1 tablespoon lemon juice and 3 tablespoons of rapeseed oil. Keep whatever you don't use for the salad in a jar, the surface of the pesto covered with oil. 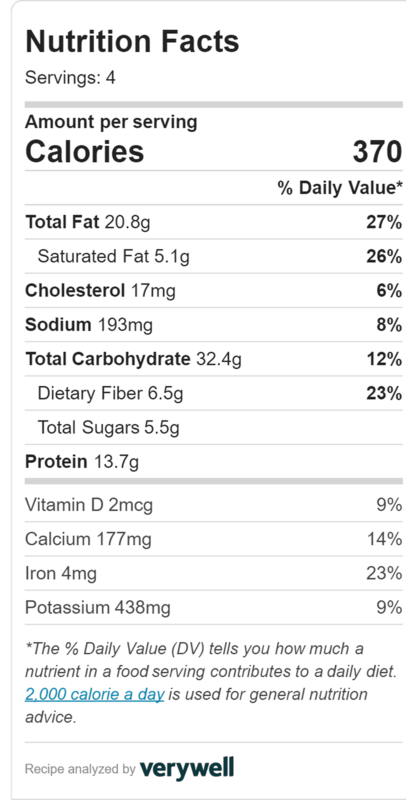 Nutrition label is a rough estimate and will vary based on your pesto ingredients. 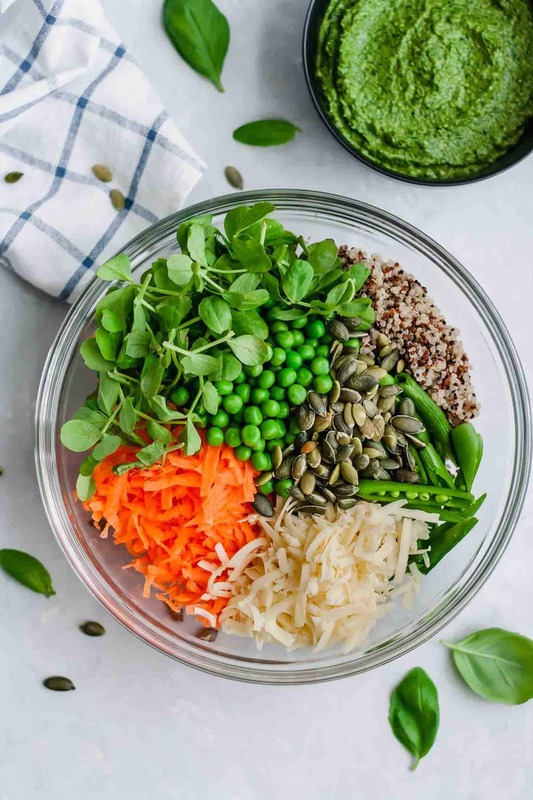 This is basically spring in a bowl! I love quinoa added to salad. And I cannot wait until fresh peas are available this spring! And riding in a duck shaped boat is now on my bucket list. Spring in a bowl is what I was going for so yay! Haha, I hope you get to cross that off your bucket list soon!